This is the pair of cordless LED window candles that simultaneously cast a brilliant light outdoors and a gentle glow indoors. Each of the two candles' three white LEDs are curled so that their tips are pointed outdoors, projecting a bright light that can be seen clearly from the street while emitting only subtle illumination in your home. An integrated timer automatically turns the candles on and off at six, eight, or 12-hour intervals and the candles adjust from 13 1/2" to 15" high to ensure the light is never obscured by window mullions. 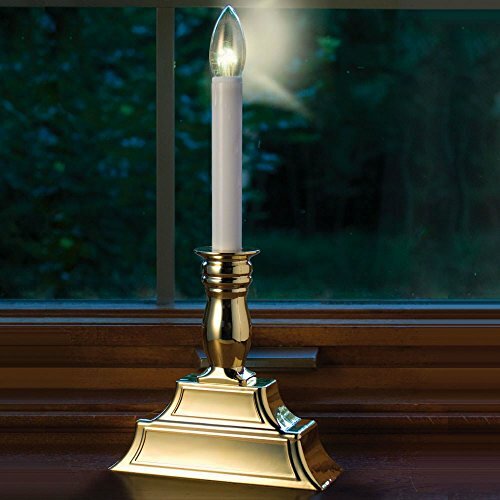 The candles have a glass "flame" and a brass-colored, 2 1/2"-deep plastic base that fits easily on window sills.